This article is about the Gerry and the Pacemakers song. For the film, see Ferry Cross the Mersey (film). For the soundtrack album, see Ferry Cross the Mersey (album). (1964) "Ferry Cross the Mersey"
"Ferry Cross the Mersey" (sometimes written Ferry 'Cross the Mersey) is a song written by Gerry Marsden. It was first recorded by his band Gerry and the Pacemakers and released in late 1964 in the UK and in 1965 in the United States. It was a hit on both sides of the Atlantic, reaching number six in the United States and number eight in the UK. The song is from the film of the same name and was released on its soundtrack album. In the mid-1990s a musical theatre production also titled Ferry Cross the Mersey related Gerry Marsden's Merseybeat days; it premiered in Liverpool and played in the UK, Australia, and Canada. "Mersey" refers to the River Mersey in northwest England, a river that flows into the Irish Sea at Liverpool. The Mersey Ferry runs between Liverpool and Birkenhead and Seacombe on the Wirral. The song is often misspelled as "Ferry 'Cross the Mersey", but according to the song's lyrics, the track is correctly titled "Ferry Cross the Mersey". "Cross" is not a contraction of the preposition "across" but rather an imperative verb – "Ferry, cross the Mersey." In the US, the title was rendered on all 45s – even reissues from decades after the original release – as "Ferry Across The Mersey". In May 1989, a charity version of "Ferry Cross the Mersey" was released in aid of those affected by the Hillsborough disaster, which claimed the lives of 95 Liverpool fans the previous month (a 96th, Tony Bland, died in 1993 as a consequence of that disaster). The song was recorded by Liverpool artists The Christians, Holly Johnson, Paul McCartney, Gerry Marsden and Stock Aitken Waterman. The single held the #1 spot in the UK chart for three weeks and the Irish chart for two weeks. Frankie Goes to Hollywood recorded a cover of "Ferry Cross the Mersey" for the B-side of the 12-inch single "Relax", released in October 1983. This was subsequently included on their album Welcome to the Pleasuredome (1984) and later compilations Bang!... The Greatest Hits of Frankie Goes to Hollywood (1993) and Maximum Joy (2000). Also in 1983 the Norwegian group Vazelina Bilopphøggers recorded a cover of "Ferry Cross the Mersey" in a Norwegian dialect, called "Ferje over Mjøsa" (Ferry Cross Mjøsa)), for the album På tur. Canadian popular musician Burton Cummings (of The Guess Who) recorded a solo version on his 1996 live album "Up Close and Alone." In 2003, Pat Metheny included an instrumental cover of this song on his acoustic album One Quiet Night. In 2008 Norwegian band Farmers Market recorded a Bulgarian version, titled "Lodtschitze Mini Maritza", for the album Surfin' USSR. ^ "Gerry's Datebook". Britbands.bravepages.com. Retrieved 28 March 2014. ^ a b Unterberger, Richie. "Gerry & the Pacemakers > Charts & Awards > Billboard Singles". Allmusic. Retrieved 4 July 2009. 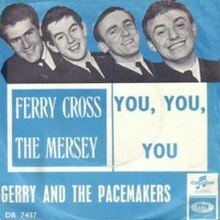 ^ a b "Chart Stats - Gerry And The Pacemakers - Ferry Cross The Mersey". Retrieved 4 July 2009. ^ a b "Chart Stats - Gerry Marsden, Paul McCartney, Holly Johnson And The Christians - Ferry Cross The Mersey". Retrieved 4 July 2009. ^ "The Christians, Holly Johnson, Paul McCartney, Gerry Marsden & Stock Aitken Waterman - Ferry 'Cross The Mersey". australian-charts.com. Archived from the original on 9 December 2009. Retrieved 4 July 2009. ^ "The Christians, Holly Johnson, Paul McCartney, Gerry Marsden & Stock Aitken Waterman - Ferry 'Cross The Mersey". austriancharts.at. Archived from the original on 8 December 2009. Retrieved 4 July 2009. ^ "The Christians, Holly Johnson, Paul McCartney, Gerry Marsden & Stock Aitken Waterman - Ferry 'Cross The Mersey". dutchcharts.nl. Archived from the original on 9 December 2009. Retrieved 4 July 2009. ^ "Nederlandse Top 40 - week 26, 1989". Retrieved 4 July 2009. ^ "charts.de". charts.de. Retrieved 28 March 2014. ^ "irishcharts.ie search results". Archived from the original on 3 June 2009. Retrieved 4 July 2009. ^ "The Christians, Holly Johnson, Paul McCartney, Gerry Marsden & Stock Aitken Waterman - Ferry 'Cross The Mersey". norwegiancharts.com. Archived from the original on 8 December 2009. Retrieved 4 July 2009. ^ "The Christians, Holly Johnson, Paul McCartney, Gerry Marsden & Stock Aitken Waterman - Ferry 'Cross The Mersey". hitparade.ch. Archived from the original on 4 December 2009. Retrieved 4 July 2009. ^ Catwoman (17 July 2002). "h2g2 - ZTT Records 1983-1988 Part 3: Remixes". Bbc.co.uk. Retrieved 28 March 2014. "I Don't Know" / "Come On to Me"
This page was last edited on 21 December 2018, at 05:28 (UTC).